When you’re in the workplace, you cannot watch YouTube nor you can browse third party websites. A few years back when Nokia was major smartphone brand, you had to rely on the browser to get news and updates on cricket scores. Today, you can download a sports app from the play store for the same. CricBuzz is a popular portal for cricket lovers. 100s of people access the website every day. Opening a website in a browser can be frustrating on slow 2 connections. Keeping this in mind, Times Internet, the company that owns CricBuzz has launched an Android app for the iPhone, Android, and Windows PC. CB (for all the 3 OS) has a nice UI. It is eye friendly because the theme of the app is dark. On its main Window, Cricbuzz displays a slider that boasts the scores of live cricket matches. This window also displays the top stories (news on your favorite cricketers, umpires, ongoing matches, etc). When you tap on a story, Cricbuzz opens the hottest news in the app itself. CB doesn’t prompt users to open a third party web browser on their phone. The app features an option to read the news. If you don’t want to strain your eyes, tap this button. If you find the news interesting, Cricbuzz allows you to share it on social channels. To switch to the next or previous top story, the user to swipe his finger on the screen to the left or right. Cricbuzz allows users to check the scorecard in detail. 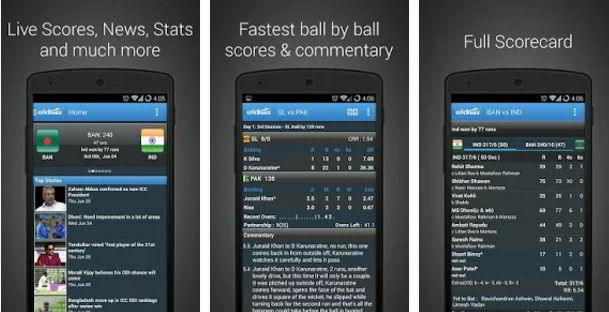 You can check stats and ratings of your favorite cricketers through this Android app. If a series or a major tournament is live, the app displays detailed statistics on the matches. For example, you can know which player has scored the maximum runs, taken the most wickets, hit the most fifties, centuries, sixes, fours, etc. To make you aware of which team will enter the finals, semi or quarter final, the Cricbuzz app for Android features an option to check the points table. The Cricbuzz Android application has a gallery section, with which you check the photos of players in action on the field. If you want to know what happened in the world of cricket on the same date of previous years, open the menu of Cricbuzz app and tap on this day that year option. Cricbuzz features an archives section where users can go through the news covered in the previous years. The archive interface has a tool to search news. To get latest T20 cricket world cup scores on your phone, make sure that you follow the above links to download the app on your mobile phone.